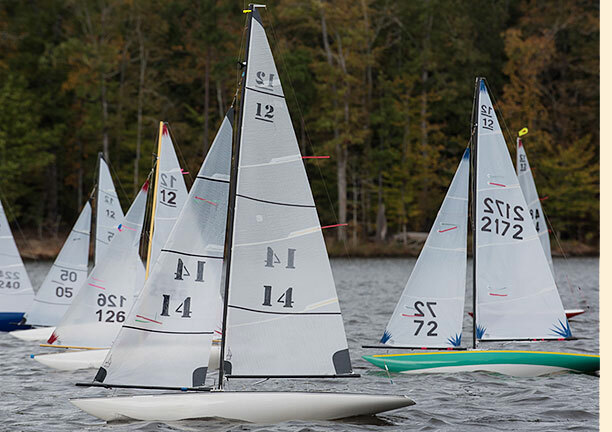 The 2017 EC-12 National championship Regatta was contested by 26 sailors on Lake McIntosh, Peachtree City, GA. The host club was the Turtle Pond MYC, AMYA club #289. 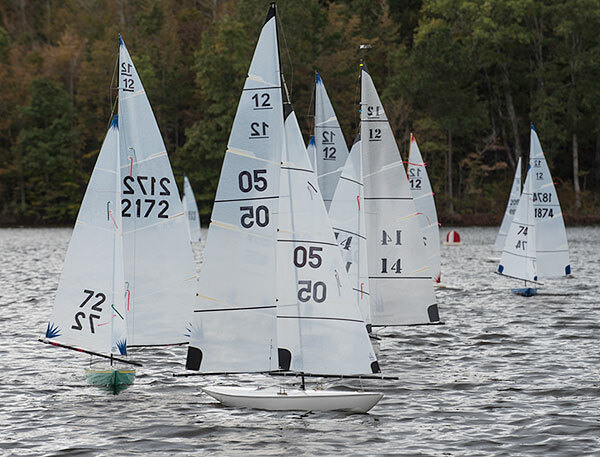 The three-day event, Oct 26-28, was characterized by moderate temperatures, and variable winds from the NNW to S. Early fog and light winds each morning caused short delays while a suitable course could be set to maximize the skill of the sailors in the two-fleet promotion/relegation format. Day one: A frustrating wind refused to settle into a consistent and ideal direction thru the entire day. The start line moved from the north to the south frequently requiring course adjustments. The patience of the competitors was needed and appreciated! Following a two heat seeding race based on the National Seeding List, 6 races ( 12 heats ) were logged. By days end, David Ramos and “rookie” Peter Feldman led the field with the next four positions closely packed. Day two: Friday’s early fog and calm winds forced a near hour long delay (made up later in the day by popular vote). Then we were off and running…winds 8-10 from S to SSW for the remainder of the day. 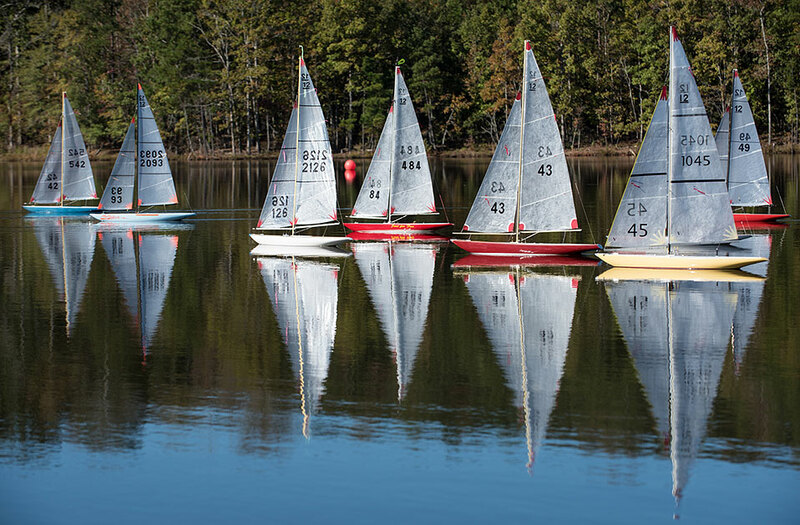 8 races (16 heats) kept the Red and Blue fleets in constant motion on and off the course. “Mr Bubble”, awarded to Don Hain, promoted then relegated eight straight times…off for lunch break only! Feldman sailed to the top of the sheet with top three placements thru the day. Day three: Forecast dismal. 90% chance of rain, temps low 40’s and light winds. Actual: cloudy and cool, the winds came and the rain did not ( 10% ). 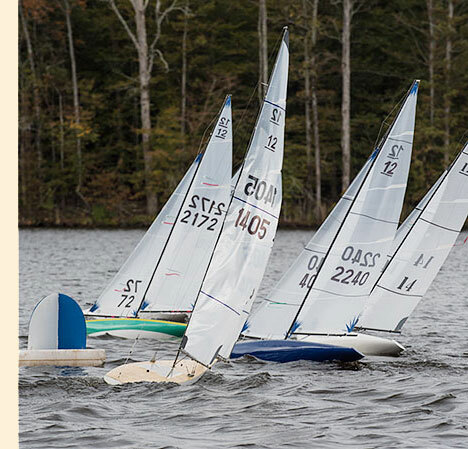 With a 3pm stoppage planned 7 races( 14 ) were sailed. Ramos charged back to the front while Feldman chased. Meanwhile, Alan Perkins was the challenger of the day in a close one point battle with Thomas for the next finishing positions ahead of Don Ouimette. One hour after the last mark was pulled from the lake…100% RAIN! The regatta is for the sailors and the the sailors make the regatta. With patience, understanding and positive attitudes by all a great time is easy. Only two protest committees were called, all others resolved on course. The awards ceremony, successful raffle of donated gear and banquet at Flat Creek Club offered time to talk to one another without numbers. Thanks for the efforts of all to attend the NCR…from Vermont to Florida it was truly an East Coast event! Racing Committee: Tom Evens, RD; Dave Linville, Asst RD; Sean Ellis, Scoring; Chuck & Linda Ellis, Logistics; Lew English, Bill Lechner, Mike Kline & Laverne Jones, Rescue And Support; Nathan Kline (age 7) Raffle Emcee. 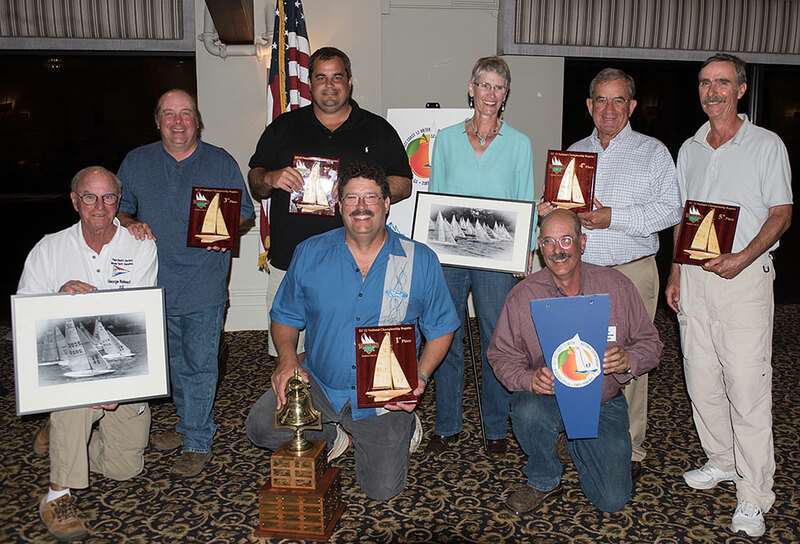 L-R: George Balaschak, Bubble Boy; Danny Thomas, 3rd; Peter Feldman, 2nd; Dave Ramos 1st; Anne Gates, Last Place after sailing all races; Jack Shepard, Blue Fleet Winner; Alan Perkins, 4th; Don Ouimette, 5th. Photos by Tom Evens and Mike Kline.